For the second time we were invited to the Museum Festival Vorau. A suitable occasion to inaugurate our new tent! This time our focus was in the middle of the 19th Century. 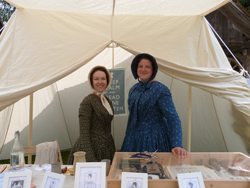 With clothes from the 1840s, we were able do delight not only the museum employees but also the numerous visitors.